Mario Schweiger (2012): Psammodromus microdactylus (Boettger, 1881). In: Martínez, G., León, R., Jiménez-Robles, O., González De la Vega, J. P., Gabari, V., Rebollo, B., Sánchez-Tójar, A., Fernández-Cardenete, J. R., Gállego, J. (Eds.). Moroccoherps. 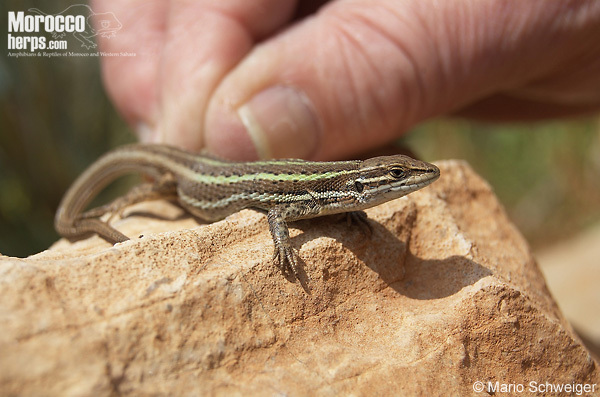 Amphibians and Reptiles of Morocco and Western Sahara. Available from www.moroccoherps.com/en/ficha/Psammodromus_microdactylus/. Version 23/09/2012. Accessed 24 Apr 2019. Global range map of Psammodromus microdactylus according to the IUCN. Psammodromus microdactylus has been described in 1881 by Böttger as Algira microdactyla. Boulenger (1887) transferred it into the Genus Psammodromus. 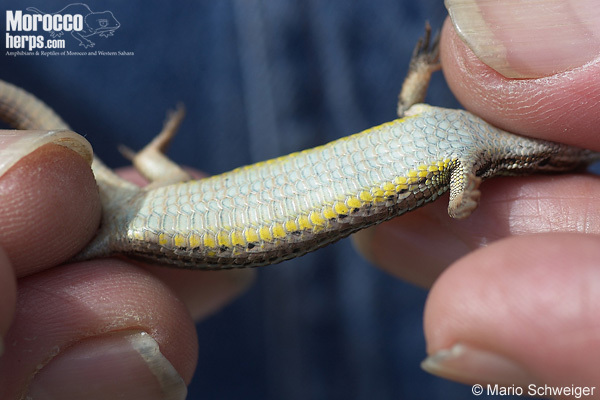 A small lizard species, very close related to Psammodromus blanci. Both may be most easy distinguished from the 3rd Psammodromus in North Africa, Psammodromus algirus, by the two inner Ventralia rows narrower than the outer. Psammodromus microdactylus. Azilal. Photo: © Mario Schweiger. To separate P. microdactylus from P. blanci is much more difficult. Most differences given in literature are not correct. For a detailed diagnosis see Bosch, in den (2005). The two best characters are the absence of a collar in P. microdactylus and the different coloration of the two species. True P. blanci (from east Algeria and Tunisia) are never green(ish) dorsaly, and the ventral side is whitish to greenish, newer with yellow. Ventral view of Psammodromus microdactylus. Azilal. Photo: © Mario Schweiger. Galewski (2001) has the opinion, in and east of the Moulouya depression Psammodromus microdactylus are intermediate with Psammodromus blanci. 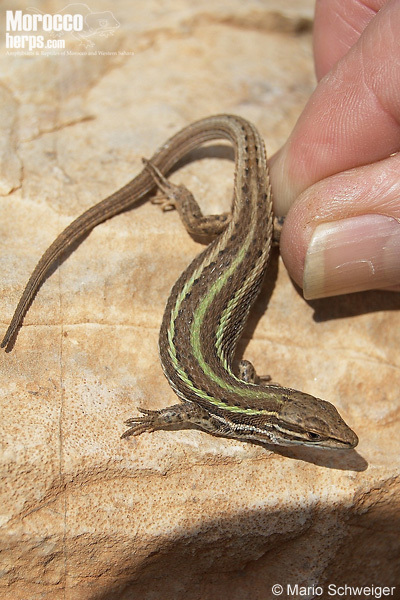 Description of coloration of Psammodromus microdactylus (on pictures and one live male from Azilal): Olive green with 3 prominent green longitudinal stripes. During mating season in early spring, males have a pea green coloration. Males differ from females by having the outer row of the ventrals yolk yellow. Maximum total length up to 150 mm. Nearly nothing is known on this species. Only a few more than 40 specimens have been collected up to now, most at the end of the 19th century, beginning of the 20th century. Since the sixties of the last century observations are very rare. 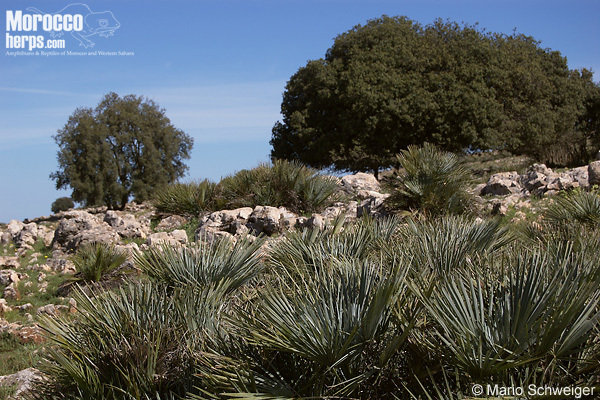 Most observations and collections have been made in and around dense Chamaerops humilis palm overgrown areas with humid to subhumid climate. Altitudinal distribution from 50 to 2250 metres asl. In contrast to most other lizard species, Psammodromus microdactylus doesn’t hide under stones or rocks – he buries itself into leaf litters or loose gravel. In contrast to Psammodromus algirus, P. microdactylus is a slowly moving lizard, seldom seen far away from shelter. (Bosch, in den, 2005). The male, we observed near Azilal was basking approx. 20 cm away from a Chamaerops bush on April 21st, 2010 at 1:00 p.m. When approaching it from 5 to 6 meters, it went into the bush – and was gone. I searched in the litter below and between the leafs, but coudn´t spot it, while my companion watched carefully the surroundings, if the lizard is changing the hiding place. Approx. 10 minutes later I saw it: sitting motionless on top of a Chamaerops leaf, probable the whole time, I was working in the bush! 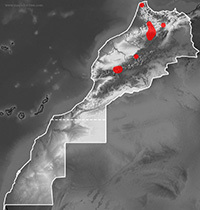 Psammodromus microdactylus is endemic to Morocco. It is known only from a few localities, therefore all are listed here: Afourer, Amred, Azilal, Azrou, Balcon d´Ito, Casablanca, Cromlech de M´Soura, Dayet Ifrah, El Hajeb, Karia ba Mohamed, Mogador, Sefrou, Sidi el Yamani, Tadlest, Tanger, Taza, Tetouan, Jbel Zalah (Fez), Jbel Toubkal, Jbel Tichka. 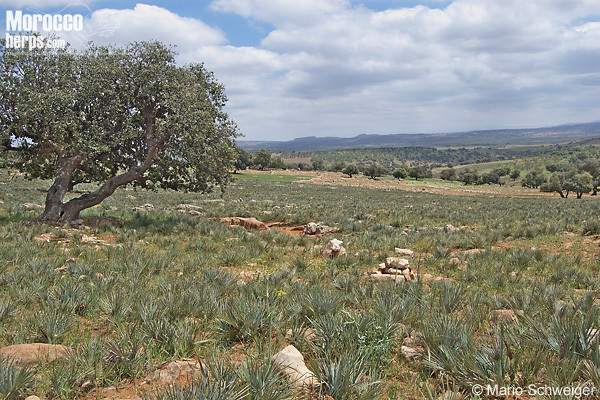 All observations have been made in (now overgrazed) slopes with Chamaerops humilis. Habitat of Psammodromus microdactylus. Azilal. Photo: © Mario Schweiger. Habitat of Psammodromus microdactylus. Sefrou. Photo: © Mario Schweiger. Abundance seems to be low to very low. During one day up to 4 specimens have been observed. But in reality, nearly nothing is known. 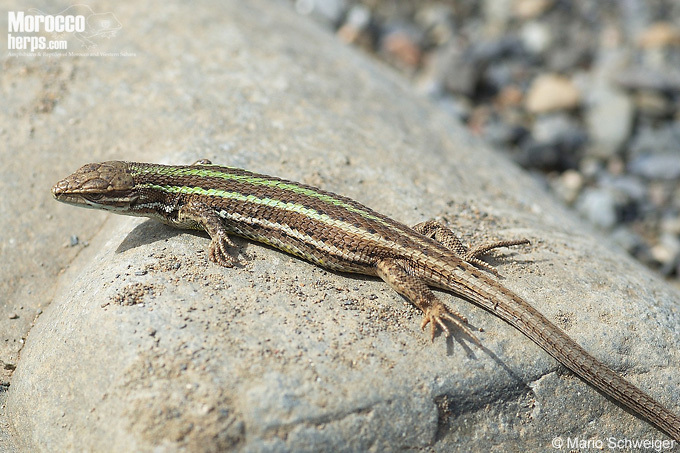 These low numbers may be a result of the secret habits of this lizard.